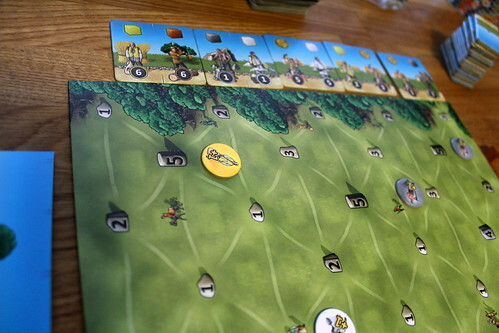 Our review copy of Milestones was kindly provided by Pegasus Spiele. Thanks a lot! “Wicket, me boy, this new land will make us rich, I can feel it in my bones. Nay, in my purse. My purse itches. We’ve barely been here five minutes, and we already delivered grain to this market here for a whole gold coin. And there will be more markets, mark my words, Wicket, me boy. Now, you take the reins and follow that road. There’s only one road here anyway, I reckon you won’t get lost on the way.” Excitedly, Wicket took up the reins of his uncle’s cart. He’d never let him drive before, never mind there was only one road, this was a big step for him. New land has indeed been discovered in Milestones, the newest game by designer team Stefan Dorra and Ralf zur Linde. But it’s not a game of finding a new continent, bothering the natives and running of with their natural resources, it’s about establishing basic infrastructure in the newly discovered, fertile, uniform Plains of Triangles ahead. But before you send out the civil engineer squads, things have to be in order on your home turf. Your home turf, that’s your player board, a variation of the popular action rondel divided into the static bottom half and the dynamic top half. No one else can mess with you here, this is your domain. Of course, since it’s dynamic you can mess it up yourself. When it’s your turn, you take two steps with your meeple – no funny meeple puns here, this one just marks your progress on the rondel – and take the action each step ends on. One step can be as long as you wish, only the castle is a mandatory stop. The top half of the player board has your resource producers, creating cubes of wood, stone, sand and grain as well as coins. This area starts out empty, but before the game starts everyone gets to pick two worker tiles to place up here. Each tile shows two workers that are mostly not producing the same type of resource, because that would be just too convenient. Having multiple workers of the same type next to each other would be great because these workers are very unassuming. You don’t even have to stop in their workshop to make them work, as long as you pass by their window and end the step on a member of the same guild. In rule terms: when you end your step on a worker, then you gain one resource of that type, plus one more for each worker of the same type that you pass in that step. Say you have three workers producing stone in a row. You start before the first, end your step on the last, you take three gray cubes. If a woodworker finds himself between all the masons and you just walk past him to the last mason, you still get three gray cubes. If you want the brown one as well you have to stop on the mason before the carpenter, step on the carpenter and then go on to the last mason. You see how important it is to have your production properly organized. Wicket was just a few turns away from throwing up at this point. His uncle was still sleeping the sleep of the slightly intoxicated on the back of the cart and they had followed this road for hours, with a tight turn every 5 minutes. Most of them too tight for the ox cart to take without going on the slope on the side of the street and almost tipping over. Even at the slow speed of the cart, Wicket was getting dizzy. But getting your production properly organized would be pretty dull, even with the adversity of not finding the worker tiles you need, if it was easy to do. And so Milestonesgives you another interest to keep in mind, besides grouping workers of the same type. Each worker also has a number from one to eight and having all your workers numbered in ascending order will win you a gold coin – not a fortune, but not to be ignored lightly, either. Now, guess how often you will see a worker tile that fits your production chain and has the right numbers to go in that place as well. Yeah, you guessed it. The bottom half of the round trip starts with the Trading House where you can exchange two cubes of resources against one coin or two coins against one cubes of resources. The exchange rate to convert resource cubes into another colour of cube is not very good this way. You can also buy one new worker tile each time you stop here. You have space for eight workers – four tiles – so sooner or later your Worker’s Row will be full. When that happens, you may simply cover up old workers with the new ones. That way, you could theoretically fix earlier errors in placing your worker tiles – realistically, things only get worse. 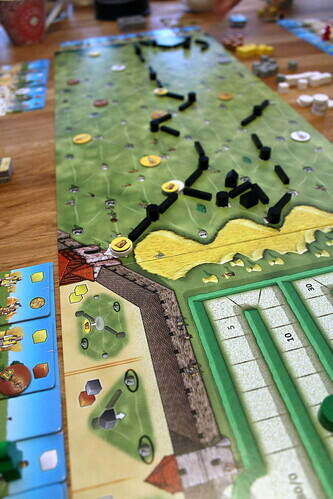 Managing your workers to be in the right order and the most efficient sequence for production is the most important part of Milestones, more important than anything you do on the big, common game board. Speaking of which, after we’re three quarters around the rondel it’s about time something happened there as well. The Plains of Triangles on the main board are, deserving of their name, divided into many small triangles. Each corner of a triangle has a milestone marker displaying its worth, from one to five points. In the next location, the Board of Works, we finally get to develop these unknown lands ahead. Also to score points, we mustn’t forget about those. Three building options are available, paid in the three possible combinations of sand, stone and wood. When stopping at the Board of Works, you may build any of these as often as you can afford, in any order. Everything you build is neutral, by the way, the other player may connect to it just like you. First, there is the road. Building roads lets you place two pieces of road along the edges of the triangles, with a milestone marker between them. You gain the point value of the printed milestone you cover with the marker. But you may only build roads connecting to the end of another road. That would be a rather long and boring road, to fix that you can build marketplaces. Like milestone markers they go on the triangles’ corners and award the points printed on that corner. New roads may start from a market place and that is the only way to fork the road in Milestones. Finally, you may build houses in the center of a triangle, provided at least one edge of that triangle has a road already. Building without a proper road access is just not done, how would you commute to your work in the castle? A house awards the points for all uncovered corners of the triangle it’s on, potentially more than extending the roads. But houses don’t get you deeper into the Plains of Triangles, the available attractive real estate runs out quickly. Some triangles have bonus chips on them that you may take when building a street there. These chips go to a matching worker on your player board and score a point every time that worker produces a resource from then on. The only other way to score points during the game is delivering grain to the markets. 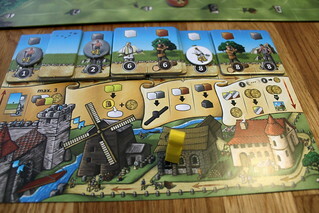 Paying two grain cubes at the next location, the mill, lets you put a sack of grains at one of the markets and wins you the scores of two uncovered corners around the market plus a coin. This is often a very profitable move, but every market only takes one delivery per game, then it closes. It’s obvious, really: we’re discovering new land, no one is living here yet, so who is going to buy that sack of grain we left at the market? Not a sustainable economy at all. Completing our circuit around the player board, we finally get to the castle, the only mandatory stop. And why is it mandatory? Taxation, obviously. When stopping at the castle you have to discard resources down to three and cover one of your workers – individual, not the whole tile. They are press-ganged into the service of your lord, you might as well call it slavery. This feudal abduction of workforce makes it necessary to hire new workers and change your board later in the game instead of resting on your early success in finding the right people. And then – we march on, around the board again. After almost a full day of travelling – and an estimated 7320 degrees of turns in the road – Wicket could finally see another marketplace on the horizon. His uncle would be proud of him. But getting closer to the market, a sinking feeling spread through his stomach. Those tents looked familiar, and so did the lightning-struck tree next to them, now that he noticed it. The road had doubled back to the same market. Well, at least they would be able to buy some bread and cheese for dinner, even if they did not do more business. But before they reached the market – he could smell the roasting meat – the road made another sharp turn, leading them westwards now. Curse the man that decided to pay road workers per mile built and not for getting people to places. The player board is an excellent piece of design. On one level, it gives you two conflicting interests in placing your workers – resources produced and ascending numbers – and forces you to constantly change parts of it by covering workers at the castle. On another level, it leaves the choice how slowly or quickly you want to walk around the board completely up to you. Sometimes walking slowly and maximizing your resources produced is more profitable, sometimes you want to complete a circuit quickly to use a good scoring opportunity before anyone else can. The rulebook is not lying about needing “a keen sense of timing”, it’s essential to go anywhere. The action on the common board is not quite as exciting, you’re building the different structures in a very abstract way, not really caring what everything is, only in it for the points. You’re also constantly worrying about opportunities you might create for your opponents – that’s okay in a two player game, but with four players thinking like this leads to a very special kind of paranoia. Someone will always be able to use your new buildings for their advantage. Trying to analyze everyone’s options slows down the game a bit, so don’t sweat it when playing with more players. And whatever you do, don’t play too defensively. We had one game where everyone tried to keep everyone else from scoring, going so far that we bend roads backwards along the edge of the board so they became impossible to extend. That game was not fun for anyone involved, we realized too late that all those moves ruined our own subsequent moves as well. My advice is: when you cannot build anything profitable this round, make sure that you can keep three useful resources past the castle, collect more resources and see what you can do building three things at once. After we got this little bit of wisdom into our thick skulls, we had much more fun with Milestones. That’s my one warning for the game: you can play it so badly that it’s not fun, more so than many other games. But don’t blame the game in that case, blame the players. After we realized we don’t have to spend all our resources whenever we could, we enjoyed Milestones a whole lot. And I’m pretty sure we haven’t seen the last of the dynamic player action rondel, especially the mechanics related to that part of the game work great. After many days of travelling without finding another market, without finding a fork in the road, without seeing another living soul, Wicket and his uncle arrived at the cliff. They couldn’t call it a cliff, standing here it was the only thing there was. It was the cliff. They had followed the road to the very end, turning and twisting. twisting and turning, never even a chance to turn around. Even now, they could not turn around, the road didn’t allow it. They build a small house next to the road and starting sowing the grain they had hoped to sell. Some places are only settled because no road leaves away from them, and with time other hopeful merchants would arrive at the cliff and join them in a simple life of farming.